I’ve been somewhat getting back into boardgames recently after a five-year hiatus. Strictly speaking I never really left them – I play games all the time and I’m not particularly bothered what format they come in so I was always playing them on and off, but the overhead required to get a bunch of people together in a room to mess with a bunch of physical cards and playing pieces is always going to make them a more infrequent pastime than just booting up Into The Breach for a hour-long session. This is why I’m quite cheered to see a few of the iThing ports of popular boardgames making their way onto Steam, as it makes them rather more accessible than they would be otherwise — and this accessibility can more than compensate for the loss of that experience of playing with other people, if the port is done right. That being said, you’ve got to pick the right kind of boardgame for one of these ports. Years ago I bought the Ticket To Ride port — reviewed it on this very blog, in fact — and by removing the physicality of it and reducing it to a set of raw mechanics it was exposed as a rather shallow experience. If nothing else, you can’t see the expression of rage on an AI’s face as you block their route from St Petersburg to Barcelona with a single train. 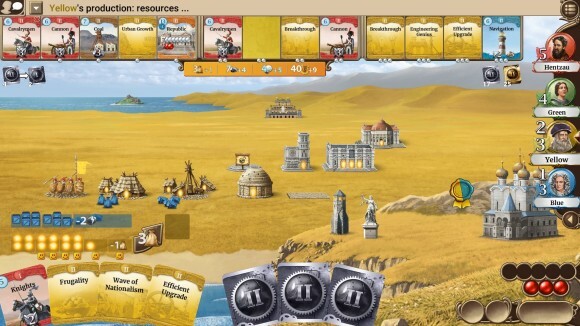 No, if you’re going to port a boardgame to a computer then it has to either gain something in the transfer or else already have enough depth to it that it can survive as a concept once the associated boardgaming accoutrements have been stripped away. By that metric, Vlaada Chvatil’s Civ-lite Through The Ages is an almost perfect candidate for conversion. And this port stands up very well indeed.